Blondies are the antithesis of brownies. In many ways they seem richer and more flavorful to me but I have never done a side by side taste test to see which I liked best. As long as there are plenty of them, they are warm, and they are chewy I really don’t care. I think blondies are more versatile than brownies because you can add all kinds of things and the flavors won’t get lost in the chocolate. Best of all, they ship overseas as well as brownies do. Which reminds me, I have three people I owe cookies to, one in the Northeast US, and two in Asia. Having two sons in the military, both stationed in Asia is a mixed blessing. I don’t get to see them much but they are close enough to visit each other now and then. Knowing that they aren’t “all alone” in Asia gives me some comfort. I am super excited though – both of them are getting to come home on leave this summer (when in Asia coming back to the US for visits isn’t a yearly thing because of the cost) and one will be stationed in the US after 5 years or so in Japan. I have always had a thing for chocolate and caramel. When I was little my dad would bring me home the Russel Stover boxes of chocolate and I would take a little bit off the bottom t see what the filling was. Then, as now, the caramel ones go first. 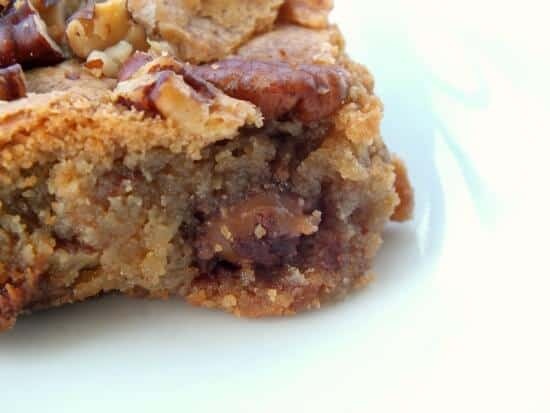 This recipe makes a 13″ x 9″ pan of blondies. They freeze perfectly as long as they are tightly sealed. 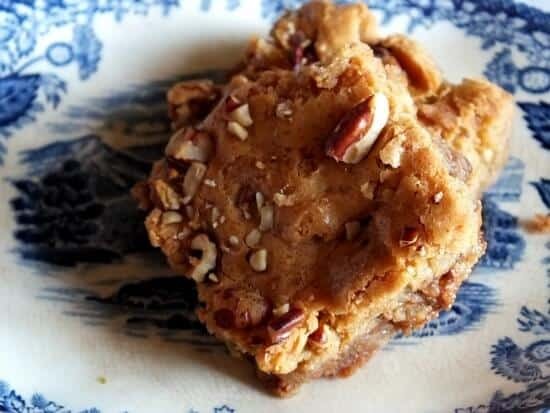 The combination of the nuttiness of the browned butter, the saltiness of the pecans, the creamy caramel, and the kick of chocolate is addictive but in a good way – unless you are trying to drop a dress size in the next two months. The following are affiliate links. If you click through and buy something I will get a small commission used for keeping the blog up and running smoothly. Thank you for being a part of Restless Chipotle! If you like this recipe you’ll probably love my book, Everything Cookies and Brownies – 300 recipes for cookies and bars of all kinds. It was published for Adams Media in 2009 and is still doing pretty darn good. Melt the butter in a heavy pan over medium heat. Let it get golden brown before removing from the heat. Bake for about 40 minutes, or until a knife inserted in center comes out with a few crumbs clinging to it. Cool, and cut into desired sized bars. Marye, I’m so happy you will have your family together for a little bit! I will have both of my boys home this weekend and spend time together with them for the first time in two years….and neither of them live overseas, but the do live in different states. I love blondies but I think Grumpy loves them eve more! I think these would be so delicious and chewy! Sounds wonderful..I’d love to get mine all together but with 8 it’s not likely. 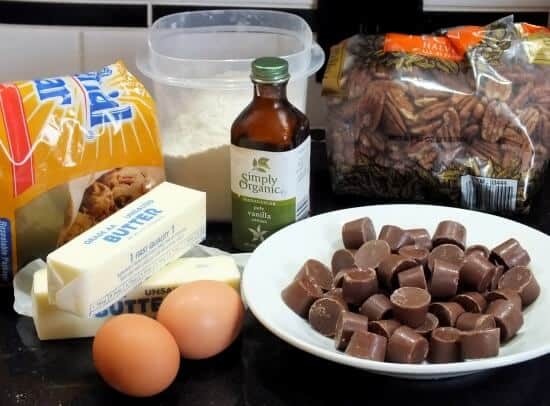 Oh these blondies look amazing…love the addition of rolos. 🙂 Rolos are an addiction here, for sure. me too! These were killer. I am such a blondie fan and these look perfect.